In a previous Photoshop effects tutorial, we looked at how to add a soft glow effect to a photo using a method that gave us the added bonus of increased image contrast and color saturation (see our Easy Soft Focus And Glow Effect tutorial for more information). What if you're already happy with the contrast and color saturation in your image and all you want is to recreate the sort of effect you could achieve with a soft focus camera lens or diffusion filter? In this tutorial, we'll look at a fast and easy way to add a more traditional soft focus lens effect to an image. The nice thing about creating this effect in Photoshop rather than with an actual soft focus lens is that Photoshop gives us complete control over the final result. The photo with the soft focus effect applied. A copy of the image now appears above the original in the Layers palette. 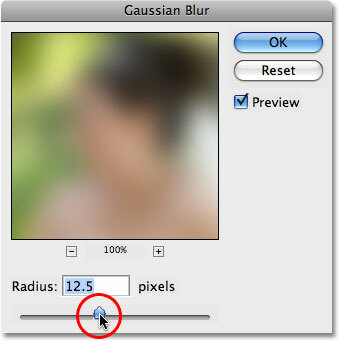 Drag the Radius slider at the bottom of the Gaussian Blur dialog box to adjust the amount of blurring. Lower the opacity of "Layer 1" to reduce the amount of blurring in the image. The soft focus effect after reducing the intensity of the blurring. At this point, the basic soft focus effect is complete, but let's fine-tune things by bringing back a little more of the original detail to certain parts of the photo, specifically the two people's faces and the flower bouquet. Photoshop makes this easy to do thanks to layer masks. Be sure to check out our Understanding Layer Masks tutorial in the Photoshop Basics section for more information on how layer masks work. 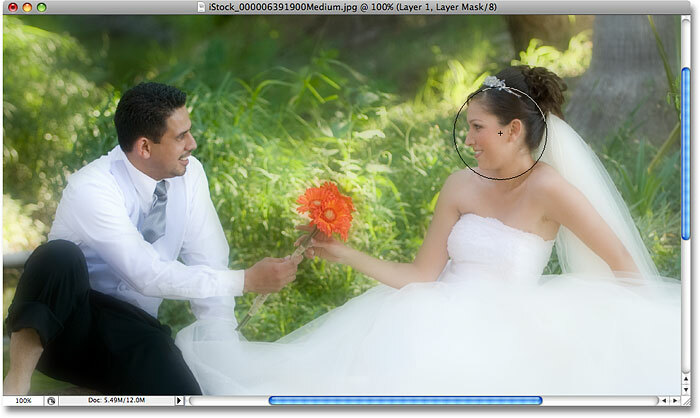 A layer mask thumbnail appears to the right of the layer preview thumbnail for "Layer 1". Lower the opacity of the brush in the Options Bar. Set your Foreground color to black. With the Brush Tool selected, black as the Foreground color, and the brush opacity lowered to 25% or so, simply paint over any areas where you want to bring back more of the original image detail. You can change the size of your brush using the left and right bracket keys on your keyboard, which are located to the right of the letter P. The left bracket key makes the brush smaller, while the right bracket key makes it larger. You'll want to use a soft-edge brush, and you can control the edge hardness of the brush by holding down the Shift key and pressing the left and right bracket keys. Press Shift+left bracket a few times to make the edges softer, or Shift+right bracket a few times to make the edges harder. Paint over areas to bring back more of the original image detail in those areas. The layer mask thumbnail shows the areas that were painted over. And there we have it! 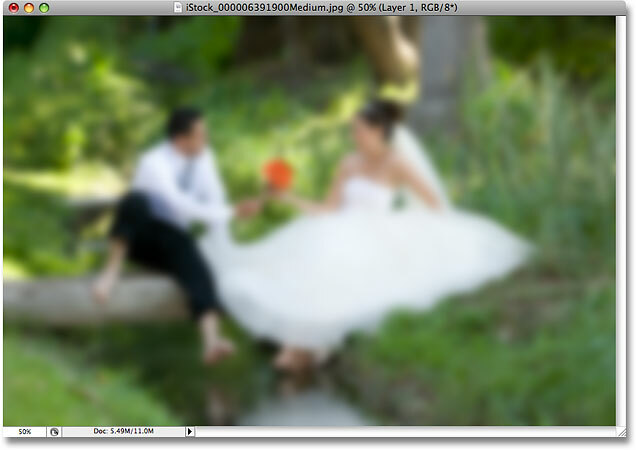 That's how to add a soft focus lens effect to an image with Photoshop! Visit our Photo Effects section for more Photoshop effects tutorials!